Susan Masino has been a rock journalist for over thirty years, and has written six books, created and hosted the 94.1 JJO Local Stage radio show from 1997-2004, and produced 8 local music compilation CDs. Masino also appears in the Van Halen DVD, The Early Years, and Let There Be Rock-The Movie. Her book The Story of AC/DC-Let There Be Rock is now published in 11 languages. Most of her life Masino has been interested in the paranormal, culminating in a self-published book entitled, The Secrets of the Universe. Over the past 10 years, she has investigated, reported on and experienced the paranormal, and is regularly interviewed by the paranormal media. Including appearances on Coast To Coast AM, Joel’s Sturgis’ After Hours AM and George Noory’s TV show, Beyond Belief. 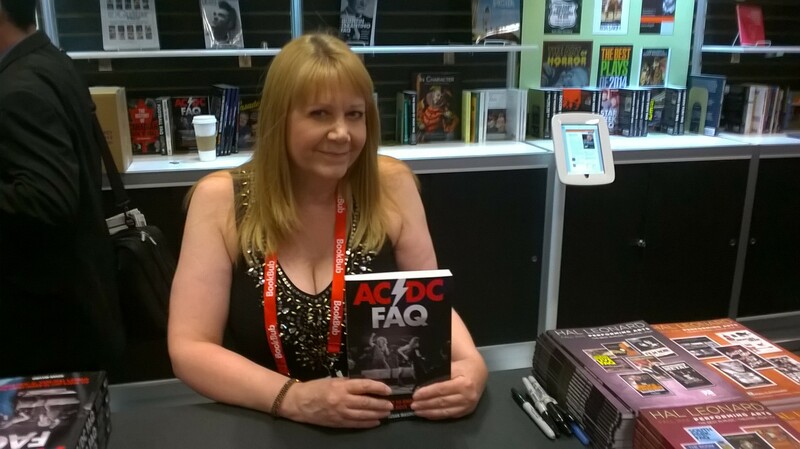 Masino just released her latest book, AC/DC FAQ-All That’s Left to Know About the World’s True Rock ‘n’ Roll Band. All six of her books are available at-www.amazon.com, www.barnesandnoble.com, and www.halleonard.com. Masino has also taught a 6-week Continuing Education class, The History of Rock and Roll, and a 3-week Continuing Education class on Rock ‘n’ Roll Journalism at the University of Wisconsin-Madison. Hi! Was just listening to your interview on Truth Frequency which was very good! Your name sounded soooo familiar and it was driving me nuts all night,especially since I recognized your Wisco accent as that’s where I grew up. So I went to your site to see about your story,and I then see that you did that local music show on WJJO! Ahhh,that’s it! I used to listen to that station all the time when I lived in Madison in the late 90’s. (Shaun The Man Of Steel,haha!) I saw some great shows back then like Ozzy,Pantera with Type O Negative (met Dime before the show),Manson right after the Columbine issue,and even split my head open stage diving at Anthrax! Great memories for sure! Nice to hear your voice again! It is an honor to have you step away before your own signing to stop by mine. Thanks again! First of all, Bon Scott was maybe the greatest front man of all time, and no disrespect to Brian Johnson, but he’s not even comparable to Bon (I’ve been a fan since 1977)! The main reason I’m writing is that, I had heard through the “underground”, after Bon’s death, that the Back In Black album was actually his album, but after he died they (AC/DC) remade it with Brian Johnson because it hadn’t been released yet and they were about to go on tour; is that true? P.S. You can’t “Touch Too Much”, even if it’s “High Voltage”! hi Susan, I heard the coast to coast show last night. I love ac/cd, I saw them with Bon in 1979. Enjoyed your interview on Coast to Coast last night on AC/DC. There is one thing you had wrong though. The song “Night Prowler” is not about a teenager sneaking into his girlfriends house. It’s about a killer. evidenced in the lines ” No one’s gonna warn you and no one’s gonna yell attack and you won’t feel the steel ’till it’s hanging out your back.” Unless the boyfriend is the killer, you are mistaken. When I first heard Back In Black, all I could think of was Bon, and then when I heard the album was actually completed before he died, I knew in my heart those lyrics were his! Seriously, song titles but no lyrics…I don’t believe that for a second! Bon Scott will ALWAYS be the man!!! I always enjoy listening to you on C2C and also hearing AC/DC. I was a member of the IATSE for 23 years and have worked concerts all my life. Was fortunate enough to get to work backstage at the AC/DC concerts many times in Odessa, Midland, and Austin, TX. from the 70’s through the 90’s. When the band was ready to sing “For Those About to ROCK – We Salute You”, we were told to put our hands over our ears even having earplugs in them. I didn’t and could barely hear for 3 days after the show. Will follow instructions next time. Would love to chat with you sometime. I’m sure we met at one of the venues in the past. Just fiinished your AC/DC FAQ book while on vacation. Great pool side reading! I saw AC/DC last month at ATT Park in SF. Great show…it seems their music goes so very well with a beer or 3! Ha! Hey, I think you really should write a book on Cheap Trick. I know there is one book on them, but I think you would do a much better job. It does seem to me that you have an interest in CT as well and their history with AC/DC. Please consider it. Thanks Susan. Have a Happy Halloween! Oh my god I finally saw you on a You Tube video for a biography of some rock group. Guys like Ian Scott were also speaking of this group . I am pretty sure it was AC DC of course. The Smashin pumkins singer was also in the documentary . Hey I love the news about your husbands company ETC and the new Led powered Source Four fixtures. I could not believe that 1.4 million of those fixtures were sold and now there is conversion kits for those fixtures. Great to see you finally . Thanks Paul the lighting guy from ten years ago , I did cruiseships. I found a snippet from one of your books mentioning Cheap Trick with British Lions at Alpine. This was the first concert I ever attended and your mention is the only evidence I’ve been able to find on the web. This was July 1978? Just strange that it doesn’t seem to be recorded anywhere. C2Cam. Are you on Facebook or Twitter. I want to know more about your work. I have an interest in metaphysics and the paranormal. Hey Susan…..Wishing you the best in 2019. Just heard your interview on C2C……..really enjoyed it. Buying the book on Amazon…..I am the lead vocalist / bass player for the paranormal and conspiracy rock band entitled “One World Government”. I would love to send you out a free CD of our new album. Let know if you have a PO Box or mailing address to send it to. Would be great to get your feedback. I will get with you on Facebook as well.